We're staying on the track of decadent desserts today. Think of it as a counterbalance to all the fresh produce and crunchy salads we're consuming during these summer days. It's all about balance! I made a chocolate silk pie for the first time. It has a chocolate wafer crust as its base and a signature silky smooth, mousse-like, chocolate filling. My son took his first bite and said "mmm...buttercream" and frankly, I think he was pretty spot on; the filling is like chocolate buttercream so you can picture what we're talking about here. One note of disclosure about chocolate silk pie - it's made with raw eggs. That isn't a big concern for me personally but it could be for some and I understand that pasteurized eggs is an option to consider. Though I've thought about chocolate silk pie for some time, I haven't made it until now - not because of the raw egg issue but because my family already has a favorite chocolate (pudding) pie that's a whole lot lighter. When you find something you like, you tend to stick to it. That said, I figured it was time to mix it up just a little and give chocolate silk pie a try. Unsweetened dark chocolate gives this pie unmistakable chocolate flavor while butter gives it serious richness. The eggs are essential to achieving the silky, mouse-like texture, to the filling. Make the pie and let it sit at least a few hours to set up before serving. I'd recommend an overnight chill since we preferred it nice and cold, and thought the flavors were even better with time to develop and meld. This is as rich and smooth as it looks - a real treat. Serving small slices, taking the time to savor the rich yet silky lightness of this pie, is the way to go. My family really enjoyed this and for me personally, this pie conjures up the chocolate pies I used to eat as a kid. The difference is those came from the freezer aisle at the supermarket. I didn't grow up eating many American or European-style desserts but there were a few things we used to buy at the supermarket...Entenmann's for one, a chocolate layer cake from Pepperidge Farm, for another...and lastly, chocolate pie from Sara Lee! I think it was my brother who started buying those chocolate cream pies and I know I devoured them as a kid, thinking they were the greatest thing! I'm certainly happy to upgrade myself from those freezer-aisle desserts to homemade but those familiar childhood treats will always have a special place in my heart, and they always bring a little smile to my face when I see them at the supermarket. Now I realize you're probably basking in berries and eating your weight in heirloom tomatoes right now. I'm enjoyed those things myself but please know that I'm here, on standby, for all your chocolate needs! And today, we're talking chocolate silk pie. You can start with a variety of crusts; I've seen silk pies with all different ones so you can choose a standard buttery pie crust, a chocolate wafer crust (like I have here), an Oreo crust, or a graham cracker crust. Since I'm no good at making traditional pie dough (though store-bought pie crust is certainly an option), I find graham or cracker/wafer type pie crusts a whole lot less stressful. For this, I tracked down some chocolate wafer cookies and put the crust together using the food processor, grinding the cookies with a bit of sugar and melted butter. It takes about 8 minutes in the oven and then we're all set. A word on the chocolate filling - patience! Many recipes I looked into for chocolate silk pie generally encourage a 5 minute mixing time in the stand mixer after incorporating each egg. With 3 eggs in this recipe, that means 15 minutes in this mixing process alone. Though the New York Times recipe I used did not specify this 5-minute rule, I'm glad I exercised patience and allowed the filling to mix thoroughly because I ended up with a nice smooth, billowy filling. If you can, it's a good idea to use superfine sugar in this recipe. I saw a recipe suggest this and I would have gladly used it but for some reason, superfine sugar seems to have disappeared from supermarkets. Since the majority of recipes did not specify, I went ahead and used plain granulated sugar. I was worried for a while because my mixture continued to have a bit of a grainy texture until almost to the end. But miraculously, by the time the 3rd and final egg was incorporated into the chocolate filling, the mixture was smooth and silky! What a relief! Incidentally, flavor your chocolate filling with a teaspoon of brandy, rum, Kahlua, Amaretto, Grand Marnier, or other kind of liqueur you enjoy with chocolate. I stuck with just a little vanilla extract but you can do otherwise. If you want to go the extra mile, take some heavy cream and whip it up to spread on top of your pie before serving. I took the easy route and just sprinkled the top of my pie with some reserved crumbs that was used for the crust. The pie really doesn't need extra creaminess but a little extra squirt or spread of whipped cream is really nice. I read somewhere that one of the things you should do during the summer is bake a pie. I assume they meant a fruit pie of some sort but for now, this is my summer pie! This pie is all gone now; the pie plate's been washed and put away...so I guess it's time to get working on the next chocolate treat! Make crust: Preheat oven to 350 degrees. Finely ground chocolate wafers with the sugar and salt in a food processor. Add melted butter and process until the mixture comes together. Reserve 1/4 cup of the crumbs and set aside (to use as topping later). Place the rest of the crumbs into a 9-inch pie pan, pressing it evenly across the bottom and up the sides of the pan. Bake for 8 minutes. Set aside and allow to cool. Make filling: Melt chocolate and espresso powder (if using) over a pan of just simmering water. Set aside and let cool to room temperature. Cream butter and sugar together in the bowl of a stand mixer fitted with the paddle attachment on medium-high speed until very light and fluffy. Scrape the bottom and sides of the bowl, as needed. Mix in salt and vanilla extract (as well as liqueur, if using). Add the cooled chocolate and mix well until evenly incorporated. Next, add eggs, one at a time, mixing on medium-speed for 5 minutes following each egg (i.e., 15 minutes of total mixing time in this process). The filling should be more fluid, silky and smooth at this point. Pour and spread filling into the cooled pie crust. Carefully cover and refrigerate the pie until set - at the very least 2 hours, or overnight (a longer chill time is better and I recommend overnight). Sprinkle the reserved crumb mixture over the top of the pie before serving. Slice and serve with whipped cream, if desired. I am drooling...that chocolate filling looks out of this world, Monica. haha! Hi, Monica! That is the most delightful comment. You are definitely my kind of gal! I like your summer pie!! :) Chocolate is always a good thing! 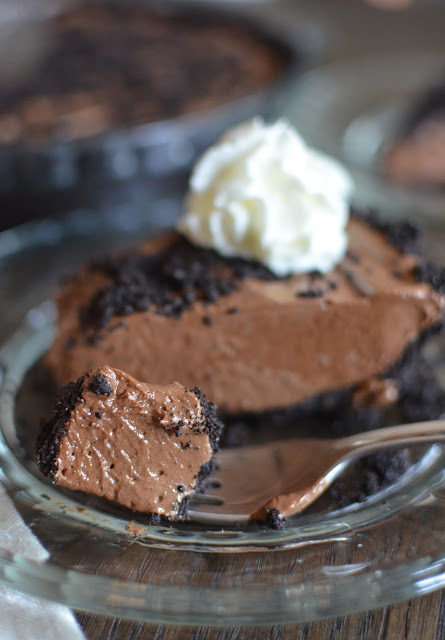 I've never made a chocolate silk pie before but you have me dreaming of one after reading this post! Wow Monica, this chocolate pie looks decadent...so smooth and silky...I love it! I can imagine how it must taste...yum! I agree Monica, chocolate silk pie is the perfect balance to a salad. Love everything about this.......Looks so creamy and delicious! A little of everything, right, Cheri! ; ) I was glad the filling was nice and fluffy/smooth by the end of all the mixing...definitely worth the time. OMG!!! Monica, I legit went weak in the knees on seeing that photo where you were pouring that chocolate filling inside the wafer crust! This isn't a chocolate silk pie, this is rightfully a chocolate MEGA silk pie! That filling is so gorgeously silky smooth and velvety! I can't take this! I need a big slice of this RIGHT NOW!!!!!! haha - thanks so much, Samina. I love your enthusiasm - clearly, you love food and baking as much as I do. : ) Hope you have some silky chocolate pie waiting for you in the near future. Even if not, I know there are more than enough delicious treats coming out of your kitchen! Oh my goodness, I could just jump in and swim in that chocolate! Perfectly prepared and certainly, perfectly photographed! Have a delicious day, Monica and thanks for sharing this wonderful chocolate pie recipe! Thanks, Roz. You have a wonderful day and enjoy the rest of the summer! I was worried about my filling until that last egg got fully incorporated and it transformed into this very smooth, fluffy chocolate filling. I'm glad I finally made it. I think your chocolate-loving husband would enjoy it. ; ) Hope you have a great rest of the week, Kelly! Chocolate filling looks amazing dear. Mouth watering. Thank you for such a lovely share! Hey Monica - I left a comment yesterday but I don't think it posted - you may check and see if I'm in your spam or something. Anyway - this is a beautiful pie - chocolate on chocolate rocks! This is truly a silky pie! So nice of you to try again, Tricia...don't see it in Spam folder...guess it's "glitching", as my son would say. ; ) This pie doesn't compare to the ones you can make but I was happy it worked out well enough! That image of the chocolate filling be spread has forced me to open a bar of chocolate right now. Looks too good! Just looking at your silk pie is making me ruin my diet! This is definitely a decadent and delicious pie! You are too kind! I am just barely competent, believe me...it's great to learn new things and I'm definitely learning all the time. It's more like mousse...and you're right in that it's easy. I found it just really important to give it the long 5 minute of beating/whipping in the stand mixer after each egg. That makes it light and works to dissolve the sugar. If you can get superfine sugar, I recommend it. Thanks!